The central event is the contract murder of Thomas Lyons, the owner of the largest ranch in the United States in 1917. 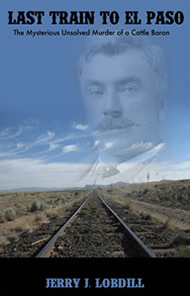 Lyons' ranch was in Grant County, New Mexico, and he was lured to EL Paso on business and murdered there. Only the hit man was convicted, although his co-conspirators were identified and obviously guilty. A motive for the crime was never asserted. After the hit man was convicted, the case was officially closed as unsolved. It was quickly forgotten and for nearly 100 years no one realized what had actually happened and who the co-conspirators really were. The murder created a sensation in El Paso, and over the course of the investigation, arrests, and court proceedings, the case drew more courtroom spectators than any case in the history of the city—even to the present day. The El Paso Morning Times and the competing El Paso Herald covered the case extensively, publishing about 140 articles about it in the nine months it took to convict the hit man. Strangely, two co-conspirators who were obviously guilty and who were indicted with the hit man were dismissed before the end of the case, and a third co-conspirator was never indicted. After the conviction of the hit man, the case was closed and not another word about it was published, even though no one denied that it was a conspiracy-to-murder case, and there was no excuse for dismissing the two men who escaped. The dismissed men and the unindicted co-conspirator were described in the newspapers as prominent cattlemen. The widow of the victim, who had been so actively engaged in pursuit of justice, strangely announced that she would not pursue the case further after the hit man was convicted. So the case was filed away and forgotten for nearly 100 years. In 2011, I discovered this case while tracing the lives of two of the individuals who were indicted in the case. These two men had been members of the murder-for-hire organization formed by the Old West assassin, "Deacon" Jim Miller. When Miller was lynched in April 1909, it was generally assumed that the omnipresent false witnesses he called in his trials just disappeared from history at that time. However, here they were as co-conspirators in a spectacular contract murder eight years later, and nobody seemed to realize who they really were. And their identity remained unknown until I uncovered the case. Last Train to El Paso presents an in-depth forensic study of the case and unravels the tangled web that was so expertly spun by the principals involved.